Hydrating mask was made of Jeju mineral water and contained pure gold. An advanced hydrating mask delivers moisture intensively overnight. It makes your skin look refreshed and glowing. Jeju Water Sleeping Mask contains Jeju mineral water and pure gold. 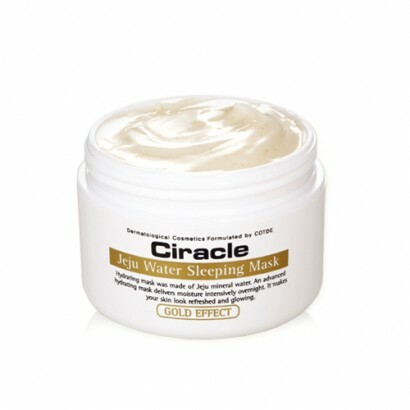 Ciracle Jeju Water Sleeping Mask is a moisturizing sleeping pack without wash off.It contains Jeju water and pure gold. It is able to supply intensive moisturizing effectiveness on your skin. You can find well-moisturized and vital skin in the next morning. * Water pradise ! Jeju water sleeping mask! You can feel the freshness when using small amount of it without any oily feeling. It contains qualified plant extracts, clean mineral ingredients from Jeju island water. And it is made at high technological factory in Jeju island. * Enjoy moisturizing time ! Intensive control for not elastic, easily tired skin, dry & tough skin. It can also deliver soothing effectiveness for sensitive skin. It contains pure gold ! It helps to revitalize and to protect from toxic substances. And also helps to prevent the trouble. You can get the revitalized skin again. 1. Apply this mask pack after toning. 2. Pat and tap smoothly on overall face. 3. Sleep within sleeping mask pack and don’t need to wash off.